Some of the most common water damage happens with washing machines. Although they are usually easy to detect, these pressurized leaks can still cause costly damage if not stopped quickly. The FloodStop for Washing Machines automatically shuts off the water supply and sounds an alarm, leaving all other household fixtures and appliances operational. This water detection unit is easily installed in about ten minutes. It includes a One Yearmanufacturer's warranty. How the Washing Machine Leak Alarm Works: Simply connect the FloodStop valve onto the hot and cold water hose bibs, and place the water/leak sensor at the base of the washing machine. When the sensor detects water, the FloodStop valve automatically closes and sounds an alarm. The valve stays closed until problem is attended to and system is reset. Easily prevent water damage from leaking washing machines. This washing machine leak detector will detect a leak, sound an alarm, and automatically turn off the water supply to the washing machine to prevent further damage. One Year Manufacturer’s Warranty. Components: Motorized Ball Valves (Two 90 degree valves, 3/4 inch Hose Threaded with union), Control Unit with Battery Backup (4 C), Water/Leak Sensor (1.25” X 7.5”) and AC Power Adaptor. Automatically shut off water to leaking appliances! I was worried about this being complicated to put in. It was very easy for me to just screw it into place just like attaching the hoses. I've tested it several times now and it works great! 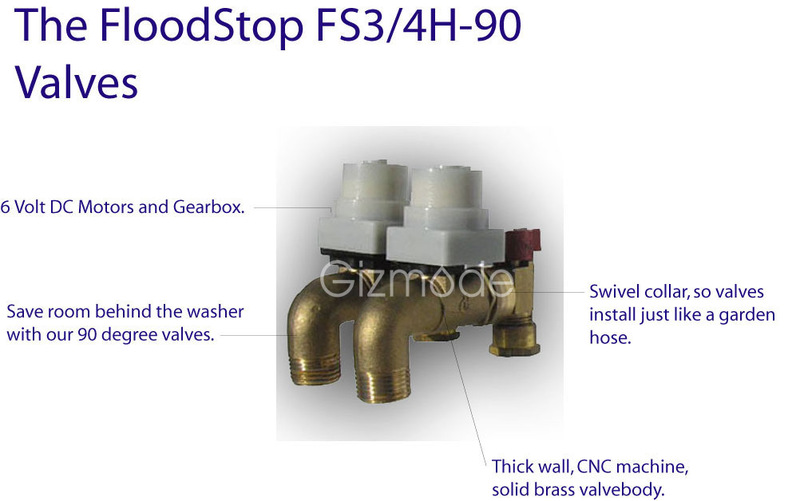 Click the button below to add the FS 3/4 H90 Washing Machine Leak Detector and Auto Shutoff by FloodStop [90 degree hose fitting] to your wish list.